This study provides an opportunity to evaluate the structures (i.e. what is needed to set it up), processes (i.e. how it works) and outcomes (i.e. how effective is it) of this model in order to inform all stakeholders involved and allow for further refinement. Queensland Health have recognised that patient flow strategies are required for emergency departments in order to i) improve the patient journey and experience; ii) reduce delays and increase access to health care services; and iii) provide best clinical practice across the state. 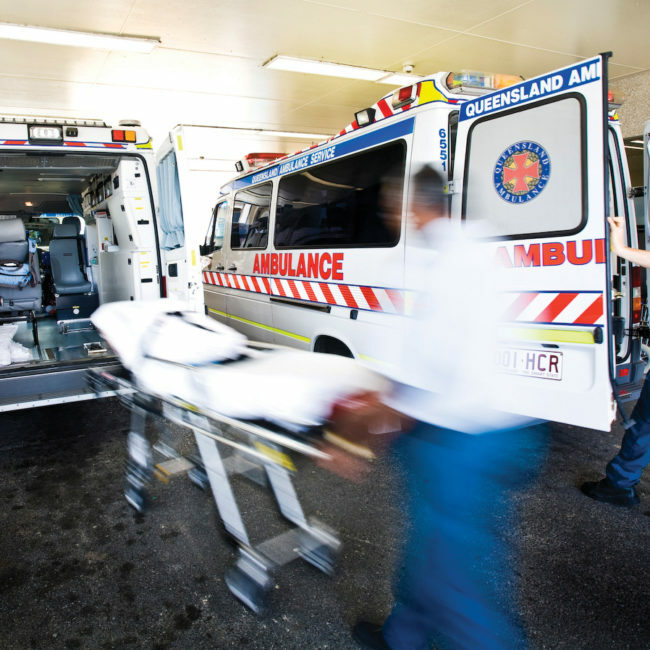 An Emergency Department Ambulance Off-Load Nurse (EDAOLN) role was commenced on Friday 17 August 2012 at the Gold Coast Hospital. The aim of this advanced nursing role was to provide rapid triage and assessment for patients arriving to the ED by ambulance and to commence initial meaningful treatment as required (such as X-rays, pathology, analgesia) on a 24/7 basis. A retrospective study of all ED presentations (n=21,454) made to the Hospital, during July 9, 2012 - November 2, 2012; 39 days before (T1), during (T2) and after (T3) the introduction of the trial of an EDAOLN role. The primary outcome of interest was time to be seen by a clinician. Demographic and clinical profiles of ED presentations made during each of the time periods were relatively similar. Time to be seen improved marginally during the trial period of the EDAOLN (T1: 34min vs. T2: 31min, p=0.002). The proportion of hospital admissions and those who did not wait differed between T1 and T2 (lower during T2 vs. T3). Most outcomes were not sustained when the role was removed (i.e. T2 vs. T3), and most returned close to baseline (i.e. T1 vs. T3). As part of a health services framework designed to improve timely access to emergency care, an EDAOLN may be one of several options to consider. The use of an EDAOLN should not detract from the underlying need to address broader health system issues impacting on ED crowding and ambulance offload delays. This research will form the basis for the potential for future improvements in health care delivery by providing information to guide decision making when faced with the issue of ambulance offload delays. The findings from this study have the potential to impact the practice and policy regarding efforts to address the issue of ambulance offload delays with an ED nurse who may be used on an intermittent, as needed basis during times of ED crowding. -Greaves, T., Mitchell, M., Zhang, P. and Crilly, J., "The impact of an Emergency Department ambulance offload nurse role: A retrospective comparative study", ' International Emergency Nursing', 2017;32:39-44. - Crilly J, Wallis M, Johnston A, O’Dwyer J, Scuffham P, Bosley E, Chaboyer W, Green D. An ambulance offload nurse in the ED: how and what makes it work? 13th International Conference for Emergency Nursing, October 2015, Brisbane.